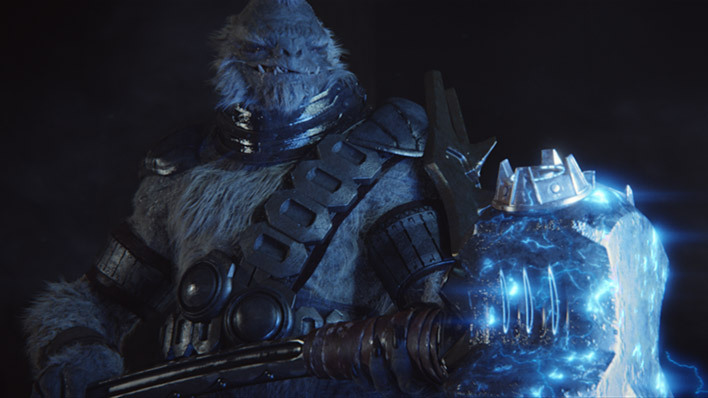 When the Jiralhanae encountered the Covenant, the Fist of Rukt was simply a stone cudgel of great age and renown, following the tradition of war hammers long held by their people. After Tartarus acquired the Fist by slaying his uncle and Chieftain, Maccabeus, his patron Prophet directed the modification of the weapon to include multiple grav-impellors and an advanced drive system. The Fist of Rukt became the prototype – and archetype – of all gravity hammers. The Fist of Rukt is massive – even by Jiralhanae standards – with a 77in (195.6cm) curved haft topped by a rectangular power core of capable of generating powerful energy fields. Six gravity drives are attached to the core, four on the striking face and two on the reverse. The reverse drives provide additional momentum to swings, while the four generators create an extremely dangerous gravity shockwave that can crush all but the most stalwart opponent in a single strike. The metal haft was broken and reforged innumerable times in the weapon’s bloody history. 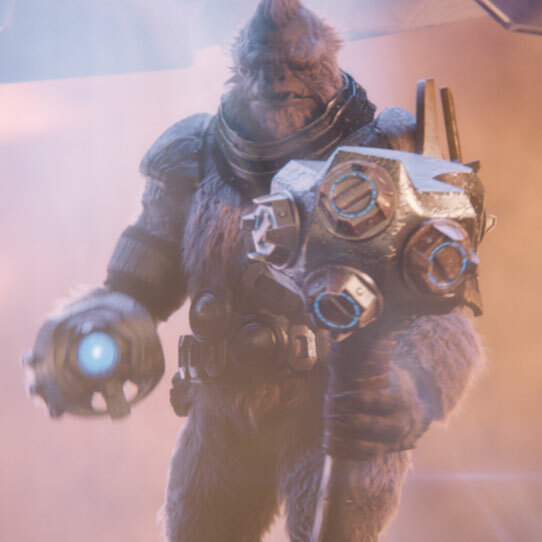 When the Fist of Rukt came into Tartarus’ possession, he carefully augmented the Fist’s haft to match those upgrades afforded by the Covenant. 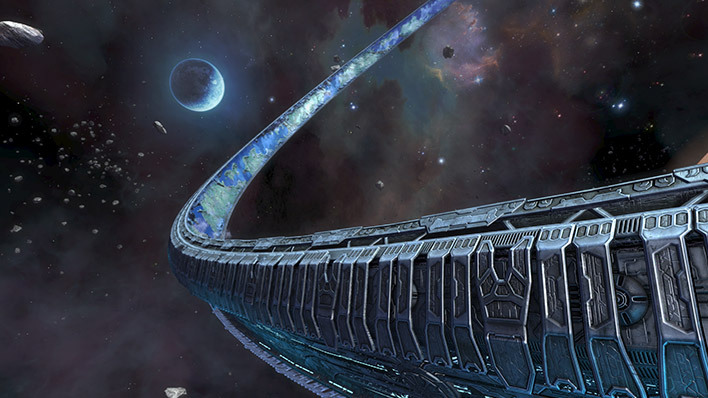 The Fist of Rukt dates back centuries, to the dawn of the Jiralhanae’s first expansions into the most inaccessible areas of their homeworld Doisac. In ancient ruins, a scavenging warband discovered a cache of rare and extremely resilient metals, among which a large stone which served as the head of the Fist of Rukt. For decades, it was used by roaming bands of marauders. Eventually, the weapon fell into the hands of the great chieftain, Rukt, who later started the unification wars that shattered the Jiralhanae’s nascent rocket-based, spacefaring civilization. During these wars, the Fist tasted the blood of thousands as Rukt and his descendants cut a bloody swath across the nuclear-blasted surface of Doisac, sealing its place as a weapon truly worthy of fear and respect. A treasured heirloom of the clan, the Fist of Rukt remained in use even after packs began to join the Covenant and wage war on behalf of the holy Prophets. 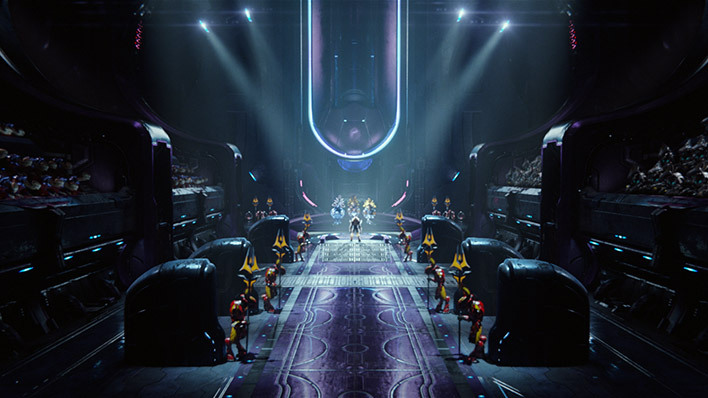 Maccabeus, chieftain of one of the most prominent clans serving the Covenant, added to the weapon’s reputation by crushing any who dared challenge his command. During the first Covenant attack at Harvest, Tartarus claimed the totem after beating his uncle, Maccabeus, in a duel. 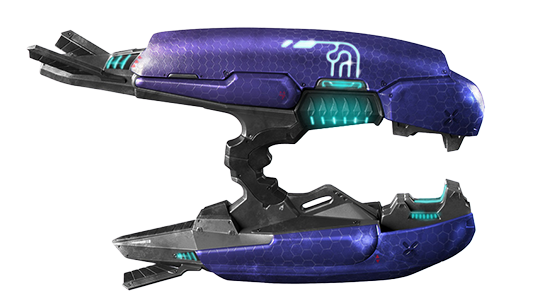 The Fist’s reputation as a weapon of mighty leaders was further enhanced when the High Prophet of Truth blessed Tartarus as the Chieftain of all the Covenant’s Jiralhanae and the weapon was modified with Covenant technology. Tartarus was an expert operator of the newly attached impellors. He used them not only to enhance the damage of the Fist’s attacks, but also to manipulate the gravitic fields near and around enemies. The Fist of Rukt was never far from Tartarus’s side, nor was it allowed to remain idle for long. 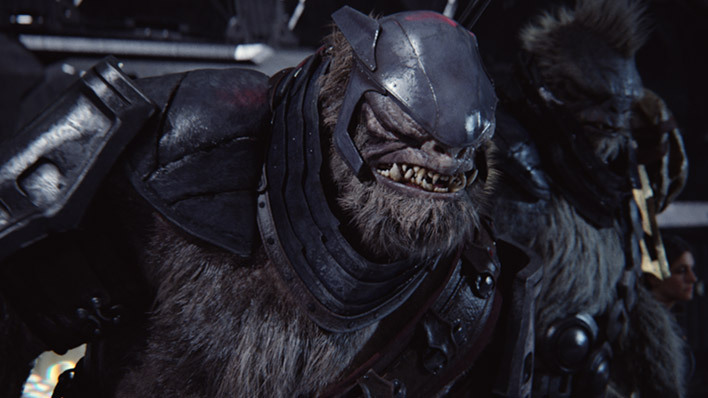 As the enforcer of the High Prophet of Truth, Tartarus used the Fist of Rukt to ensure obedience from the lesser races placed under his control. The Fist was also Tartarus’s preferred weapon for use in eliminating any chieftain foolish enough to hint at challenging his command. By the time of the Great Schism, there were few who did not dread the sight of Tartarus and his massive maul. 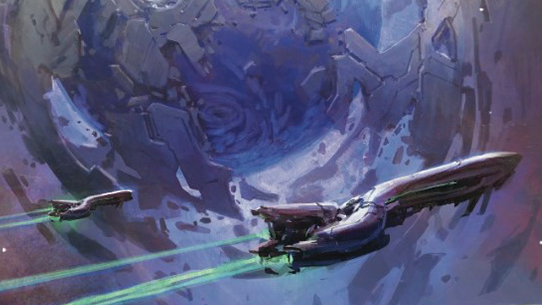 The current location of the Fist of Rukt remains a mystery following Tartarus’ death in the control room of Delta Halo. John Shirley's novel takes readers to the dawn of the Covenant and the fateful alliance between the Prophets and the Elites.